McALLEN — A picture is worth a thousand words. A picture saved on an Edinburg man’s cell phone was worth only one word — guilty. U.S. District Judge Randy Crane sentenced Jose Alfredo Guajardo Rios to more than four years in federal prison Monday morning in connection with an arrest last May where authorities found him in possession of nearly four kilos of cocaine, according to court records. Guajardo, who pleaded guilty to one of two federal drug charges last July, stood before Crane Monday to accept his punishment related to a May 9, 2017 arrest. As part of his plea agreement — prosecutors agreed to dismiss the second drug charge Guajardo faced, court records show. On that day agents arrested Guajardo and two other men, Saul Bulos-Gonzalez, and Juan Jose Dominguez-Hernandez, both of Mexico, after finding the men in possession of 3.8 kilos of cocaine at a residence in Edinburg. As proof of their nefarious actions, agents confiscated the cell phone of one of the men where they found a saved photo that showed all three men cutting a kilogram of cocaine the night before, the complaint states. The investigation into the trio began after agents received information from a “cooperating source” regarding a load of cocaine that was being stored at a residence in rural Edinburg, the criminal complaint states. “The (CS) provided detailed information pinpointing a residence located (in the 6400 block of) Lorena (Street),” the complaint states. Agents surveilled the residence and witnessed a vehicle arrive, a man, later identified as Dominguez-Hernandez, go inside, and then leave with an occupant from the residence later identified as Guajardo. The pair then drove to a drive-thru store and ordered food. 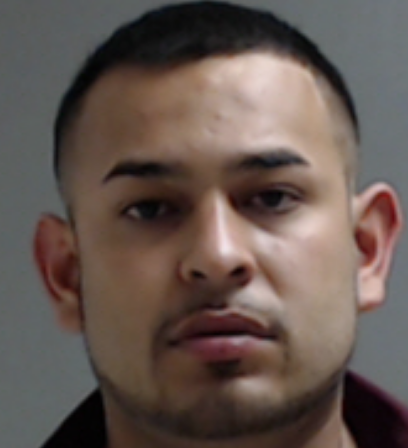 “While at the drive-thru store, Guajardo was observed signaling a blue Chevrolet Silverado truck driven by a male subject later identified as (Bulos-Gonzalez),” the complaint states. Bulos-Gonzalez then traveled to the residence Guajardo and Dominguez-Hernandez left earlier in the day and parked out front, the complaint states. “Guajardo and Dominguez-Hernandez then departed the drive-thru and were pulled over by a marked Edinburg (police department) unit for a traffic violation,” the court record states. The officer then escorted the men back to the residence on Lorena Street. “Prior to arriving at the residence, Bulos-Gonzalez, departed when he observed the police unit,” the complaint states. Subsequently Bulos-Gonzalez was also pulled over and escorted back to the aforementioned residence. Authorities then made contact with Guajardo’s common-law wife Cristal Lopez, who gave authorities permission to search the residence. During their search of the home agents discovered 3.8 kilos of cocaine in plain view on the bed inside the master bedroom, the complaint states. During subsequent interviews with Dominguez-Hernandez and Bulos-Gonzalez, they each separately stated to authorities that they had no knowledge of the cocaine found at the residence. Bulos-Gonzalez told agents he was at the residence the night before drinking beer with Guajardo; and was there to clean up the mess they had left, the court record shows. Dominguez-Hernandez claimed he was at the residence to do construction work. But during the interview with Guajardo — he admitted that the cocaine was his, and that Bulos-Gonzalez and Dominguez-Hernandez helped him the night before repackage three kilos that were headed to Atlanta.,” the record shows. As part of his punishment, the 24-year-old will also be required to participate in a drug rehabilitation program and serve an additional three years of probation after his 54-month sentence is complete. In October Crane sentenced Bulos-Gonzalez to 63 months in prison for his role after he pleaded guilty to 1 of the counts against him, court records show. The 36-year-old Mexican national, who does not have legal status to be in the country, will likely be deported at the end of his prison term. Dominguez-Hernandez, who remains in custody and also pleaded guilty to one of the two counts against him last July, is expected to be sentenced in early May, court notes show.